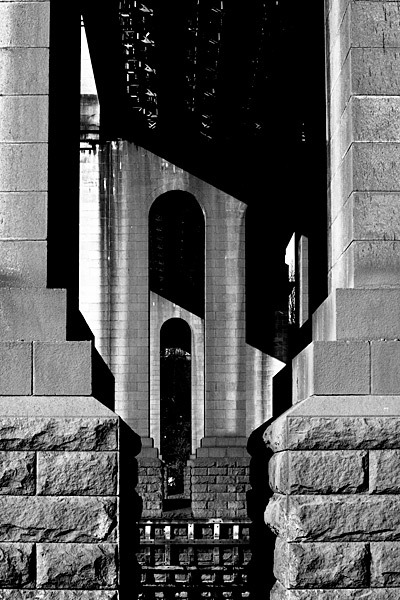 Images 2008: Rays from a late February afternoon sun reflects from fresh paint on the High Level Bridge, one of seven that span the River Tyne between Newcastle and Gateshead. 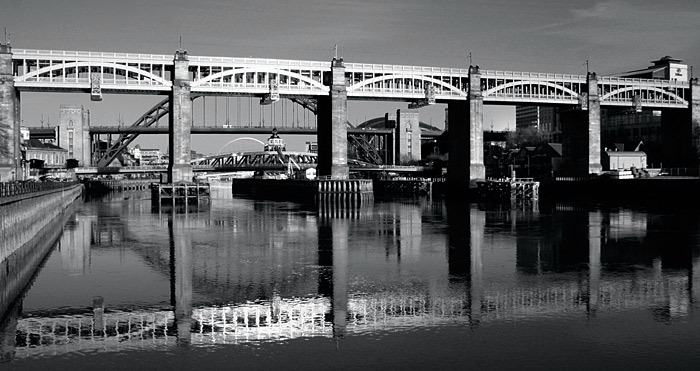 The water level Swing Bridge, the arched Tyne Bridge and the white bow of the unique Millennium Bridge stand in line beyond. Tidal and current movements often preclude sharp reflections but this was a better day than most. Robert Stephenson designed the 1849 High Level Bridge for the York, Newcastle & Berwick Railway Company. Wrought and cast iron was used to construct the six spans of the twin- deck superstructure set on stone piers. A road runs below the upper deck rail tracks. Low tide reveals more of the protective timbers at the foot of one of the river piers. The rail level is some 120 feet above the river. A programme of ironwork strengthening and restoration was completed in 2008. The accumulated paint layers of 150 years were removed back to the metal: the sand colour applied was apparently matched from samples of the 1849 original. The first sun of an early February day catches the curving southern ironwork of the bridge and will soon clear much of the thinning mist. In this low light, the modern gables on the far shore seem indistinguishable from their nineteenth century industrial forbears. The wooden jetty links the central pier to the Swing Bridge's centred equivalent a few yards downstream. Stone for the bridge piers came from quarries at Heddon-on-the-Wall and Corbridge in the Tyne Valley. Hawks, Crawshay & Sons of Gateshead were main contractors for the ironwork on this, for the time, advanced and monumental engineering endeavour. This view from the south bank through the pierced piers includes workmen busy at the end of the recent renovations. This railway bridge of 1906 was designed by Charles Harrison, then Chief Civil Engineer of the North Eastern Railway. 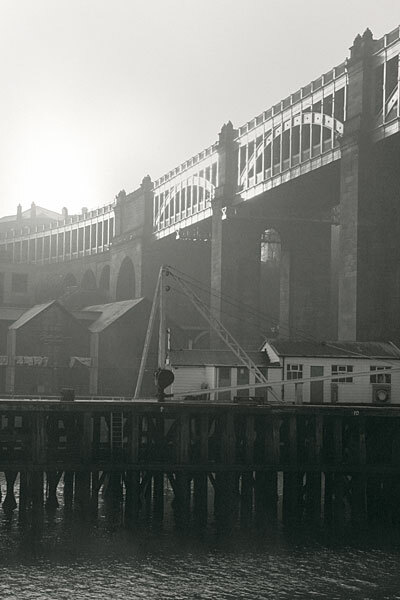 Built by the Cleveland Bridge & Engineering Company, it enabled trains to run through the Newcastle Central Station that had until then been a terminus accessed from the south by the High Level Bridge and from the north by Manors Viaduct. 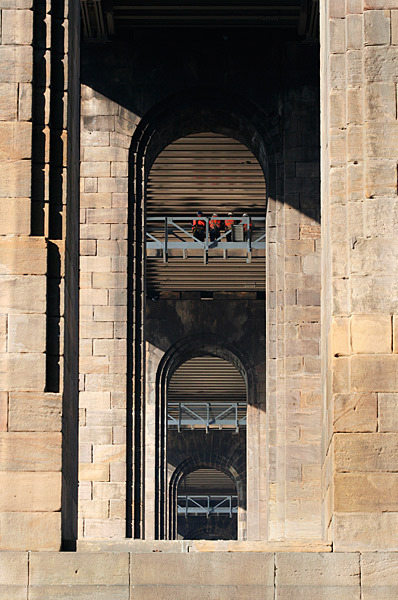 Late afternoon sunshine streams between the substantial granite piers supporting the four steel lattice girder spans. 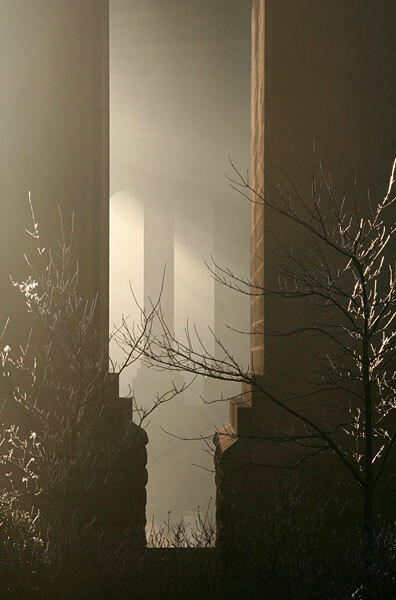 Mist drifting downriver piers diffuses the early morning sunlight of a cold February day. 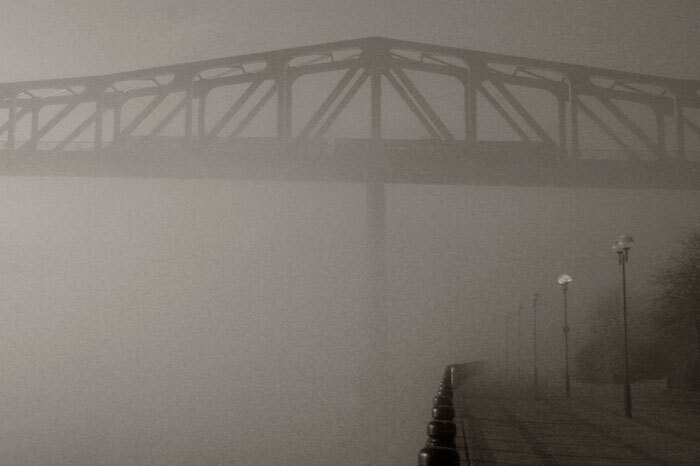 The first Redheugh Bridge of 1871 was designed by Thomas Bouch, best known for his flawed Tay Bridge of 1879. 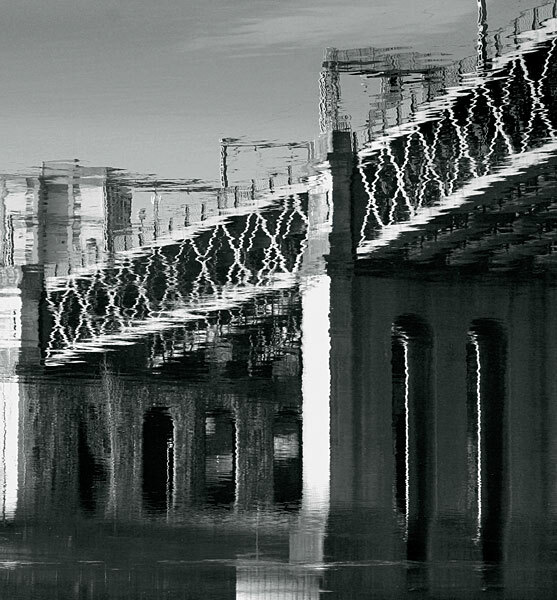 Structural problems in this bridge led to its 1901 replacement by the engineers and builders of the Forth Railway Bridge, Sir Benjamin Baker and Sir William Arrol & Company. 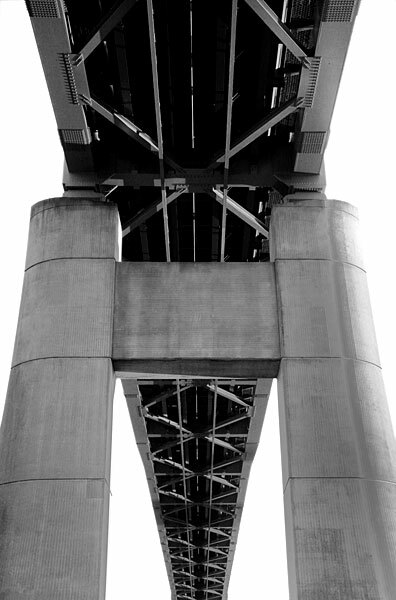 Designed by Mott, Hay & Anderson, the present reinforced concrete cantilever bridge opened in 1983. Designed by W.A.Fairhurst, this bridge links the tunnels of the Tyne & Wear Metro railway system in Newcastle and Gateshead. Its superstructure rests on two tall, twin-column, concrete piers. Illuminated at night, the steel girders are painted a vivid blue lined in white (see 15) on their recessed surfaces. 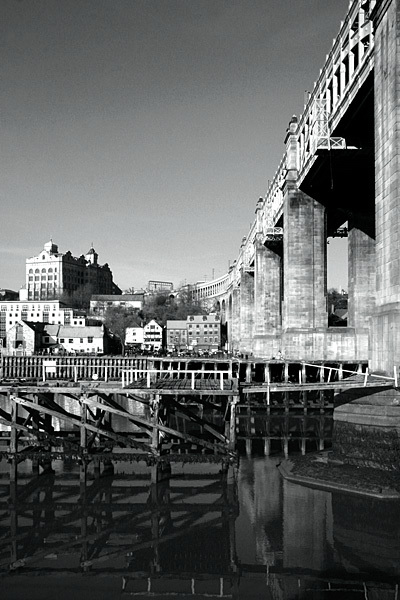 The buildings behind the bridge are all that remains of the extensive 19C locomotive workshops established in Gateshead by the York, Newcastle & Berwick Railway. They incorporated the glazed iron train shed and some of the stone buildings from the elegant Greenesfield Station and hotel opened in 1844. Both closed in 1850 when the Newcastle Central Station was completed. The twin-track Metro Bridge carries lightweight electric trains. 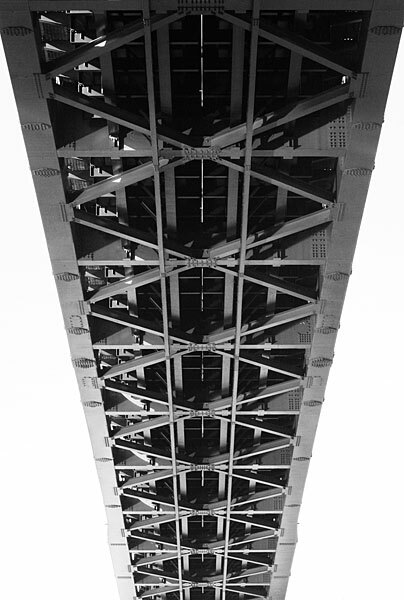 Its structure stands in marked contrast to the heavyweight four-track King Edward VII Bridge. Completed in 1978, it came into use in when train services began in 1981. The Metro was later expanded south to Sunderland and north to Newcastle Airport. Looking south along the underside of the central span. 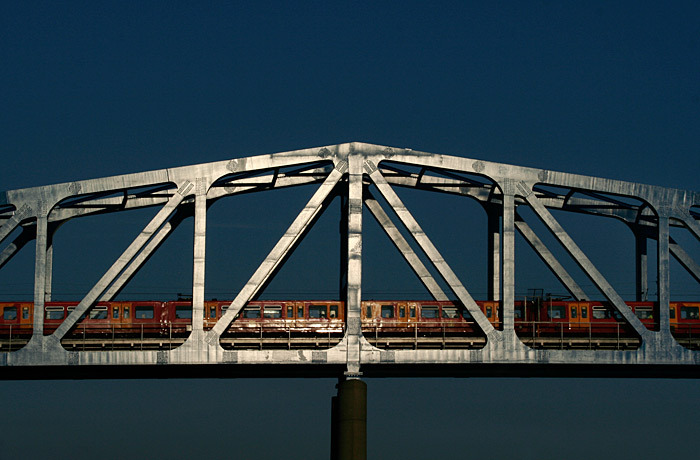 The Metro trains were originally painted in blue or red or green, with yellow detailing. This photograph was taken from the riverbank under the setting sun of a late autumn day. 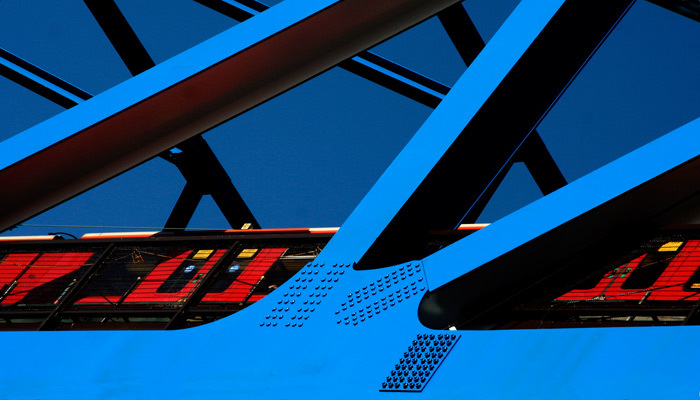 Taken from the riverside promenade some ninety feet below, the train's red is reflected in the white paint within the blue steelwork. 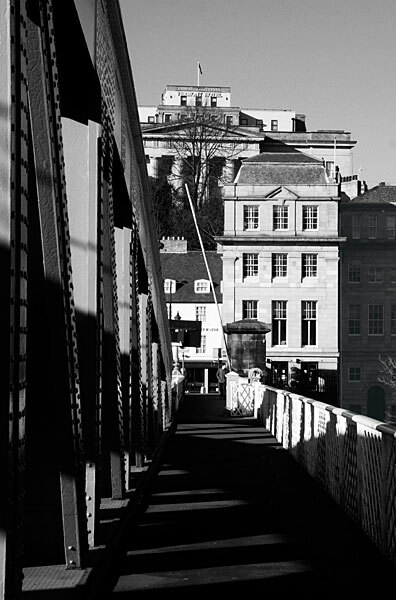 Before the completion of the High Level Bridge in 1849, the only river crossing was over the 1781 nine arch stone bridge, designed by Robert Mylne. 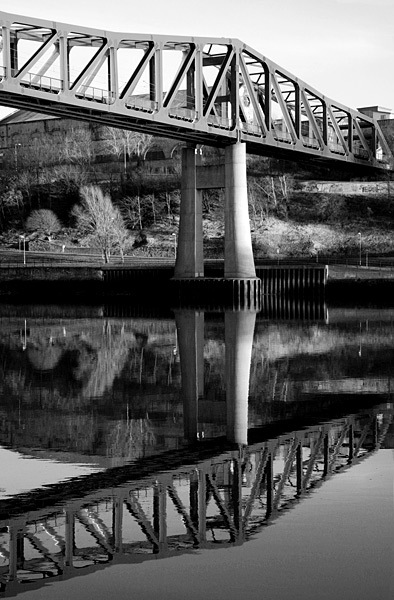 On the same site, the Swing Bridge was built by William Armstrong & Co. to allow access to their shipyards up-river at Elswick. It's still powered by the original hydraulic machinery installed during its construction between 1873 and 1876. 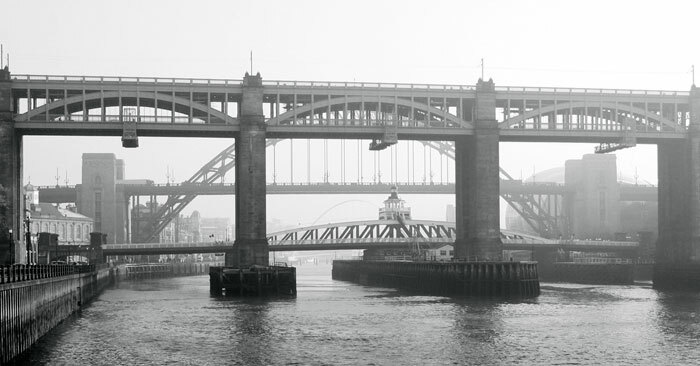 Designed by Mott, Hay & Anderson and constructed by Dorman Long & Co. of Middlesbrough, the Tyne Bridge was completed in 1928. 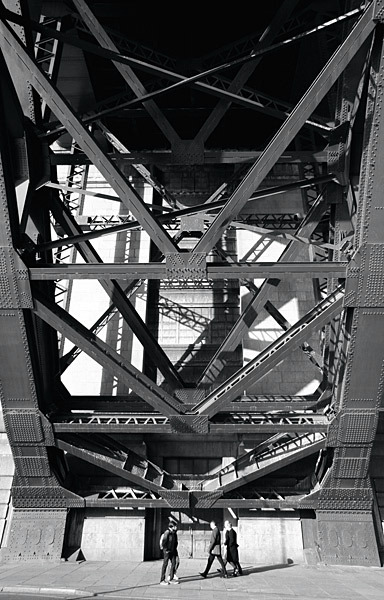 The latter Company also constructed the 1932 Sydney Harbour Bridge. The 6,000 ton car ferry Caledonian Princess was launched in 1961. 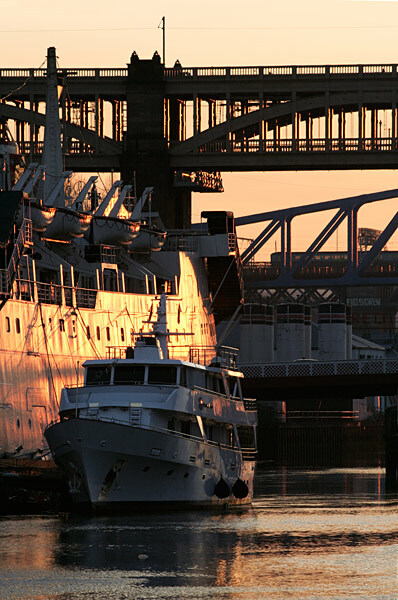 Obsolete by 1981, it was converted to house the Tuxedo Princess nightclub and moored under the Tyne Bridge until 2008. The southern ends of the High Level, Metro and King Edward Bridges form a backdrop.